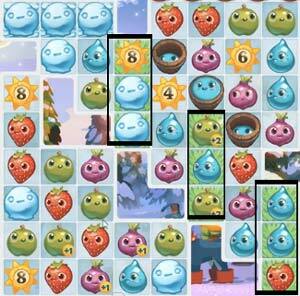 These Farm Heroes level 316 cheats and tips will help you beat level 316 of Farm Heroes. 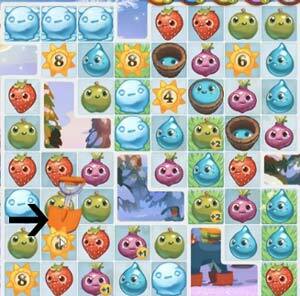 The objective of Farm Heroes level 316 is to achieve 100% growth and collect 40 onions and apples in 20 moves. Level 316 Cheat #1: Keep an eye on the snow! You have two blockers to worry about in this level: The snow and the bombs. However, it’s the snow that could give you some real troubles. While you should never a bomb count down to zero, you should really keep an eye on the snowballs. If you the snow take over the board. Clear them out whenever you can so they do not swallow up the cropsies. Remember, all you need to do is make a match alongside them to clear them. 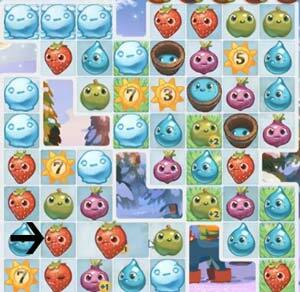 Farm Heroes Saga Level 316 also gives you some grass patches across the board to assist you. Try and make as many matches as you can on the grass. Those matches are always worth more and will help you reach your goal that much sooner! Level 316 Cheat #3: Put the shovel to use! The shovel will no doubt help you out in this level. Use the shovel booster to pluck any unwanted cropsie or object from the board. For instance you could remove a pesky bomb from the board with ease. Remember, shovels don’t use up any moves!